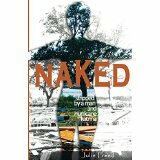 Today, I have the honor of posting a short interview with Author Julie Freed on her book Naked. She shares her account of survival during Hurricane Katrina while living on the Mississippi coast. It is both descriptive and riveting! Enjoy! Crises often seem to come in layered forms. You were dealing with the wrath of Hurricane Katrina and the dissolution of a marriage. Please tell us how the title is symbolic. NAKED – Being authentic, being vulnerable, being alive! Both the title and cover image capture being naked in several ways. My own body’s naked outline is merged with a photo of my house after Hurricane Katrina. My body represents the raw candor of the text that I hope makes the reader feel as if she is beside me on my journey. It also symbolizes the nakedness I felt in and for my community, as my surroundings were destroyed. And naked also refers to the freedom from material possessions and a dying marriage I ultimately experienced. Color inside the figure expresses the light and love I found within, despite all that dissolved into black and white around me. Many people have to endure serious challenges without the support of a strong family. Can you tell us what a strong, close-knit family unit meant to you during these devastating circumstances? It’s almost indescribable. After the storm, knowing I would be able to collapse into my mother’s arms physically and emotionally was a gift like no other. And my dad was a rock of strength. I was so fortunate. I cannot imagine those weeks or months post Katrina without their love. Having a tribe of family and friends to depend on can buoy us through anything, but we must be willing to ask and willing to accept help. What parts of your upbringing helped you become a resilient and buoyant person? My parents were strict and always challenged me to do more. But, they let me fail, they let me fall. They were not helicopter parents, making sure I didn’t scrape a knee. They provided all I truly needed and allowed me to explore and learn on my own. I think this helped develop a decent level of grit and confidence. And this was across the board in sports, in musical performance, academics. As a family we also had to deal with cancer in our world when my sisters and I were all still quite young. My mom was diagnosed with breast cancer at 42. This changes the world for children and for a family. Mom was a fighter, a survivor – a role model. I learned early, life throws hurdles. We must keep jumping or we become frozen with fear. Could you describe the drive from the Mississippi coast to the Atlanta airport for us after the house on Bridal Lane was no longer there? Weather following a hurricane is usually pristine. A storm sweeps with it the rain, clouds, and humidity. Days in its wake are breezy, sunny, and fresh, almost like the earth has been cleansed. Late August and early September 2005 after Hurricane Katrina were no different. What was different is that the interstate was empty, miles and miles of emptiness as I drove north. But even after losing my house and my spouse, I was not empty. My daughter and dog slept and Annie Lennox and Jo Dee Messina kept me company. I sang backup much of the drive. I banged a hard beat on my steering wheel singing sometimes with tears, others with smiles. I was energized. Empowered as I drove, finally in control, I knew I was driving to a better day – a better life for my daughter and for me. What do you think you personally learned after witnessing nature’s force and fury? What an amazing planet we have been gifted! Our environment, our waters, the air we breathe are all precious and we must protect and defend them. No matter how brilliant the diamond, how fast the car, how big the flat screen – Mother Nature wins. She can blow it all away. Material obsessions, in the end are immaterial. Love, family, friends, travel, ideas, creativity, inspiration, and time, time, time – These are my commodities. … And a really good hot cup of coffee! I enjoyed your interview with this author! You posed great questions to help us better understand more about her background and how she overcame struggles. I’m tempted to read “Naked” but thinking back on Hurricane Katrina is a little depressing for me. I’m glad that the author was able to move on from her losses and is feeling “free” from that period of time in her life today. Reading her story will be therapeutic for many.